Brand New Unabridged 18 Tapes 29 Hours All good things must come to end. Constant Listener, and not even Stephen King can write a story that goes on forever. 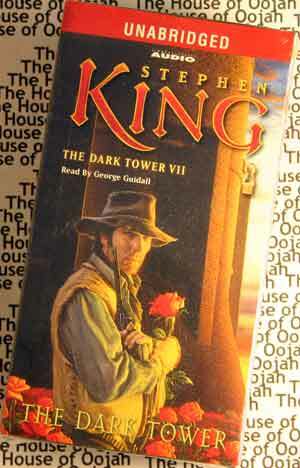 The tale of Ronald Deschain's relentless quest for the Dark Tower has, the author fears, sorely tried the patience of those who have followed it from its earliest chapters. But attend to it a while longer, if it pleases you, for this volume is the last, and often the last things are best. Roland's ka-tet remains intact, though scattered over wheres and whens. Susannah-Mia has been carried from the Dixie Pig (in the summer of 1999) to a birthing room -- really a chamber of horrors - in Thunderclap's Fedic Station; Jake and Father Callahan, with Oy between them, have entered the restaurant on Lex and 61st with weapons drawn, little knowing how numerous and noxious are their foes. Roland and Eddie are with John Cullum in Maine, in 1977, looking for the site on Turtleback Lane where "walk-ins" have been often seen. They want desperately to get back to the others, to Susannah especially, and yet they have come to realize that the world they need to escape is the only one that matters. Thus the audiobook opens, like a door to the uttermost reaches of Stephen King's imagination. You've come this far. Come a little father. Come all the way. The sound you hear may be the slamming of the door behind you. Welcome to The Dark Tower. .
(From Wikipedia) Stephen Edwin King (born September 21, 1947) is an American author best known for his highly successful horror novels. A 2003 recipient of the Lifetime Achievement Award by the National Book Awards, King's books have been enormously successful, and are often featured on bestseller lists. King's stories frequently involve as an unremarkable protagonist such as a middle-class family, a child, or many times, a writer. The characters are involved in their everyday lives, but the supernatural encounters and extraordinary circumstances escalate over the course of the story. King evinces a thorough knowledge of the horror genre, as shown in his nonfiction book Danse Macabre, which chronicles several decades of notable works in both literature and cinema. He also writes stories outside the horror genre, including the novellas The Body and Rita Hayworth and Shawshank Redemption (later adapted as the movies Stand By Me and The Shawshank Redemption, respectively), as well as The Green Mile and Hearts in Atlantis. Stephen King also wrote under the name of Richard Bachman. Stephen King was born in Portland, Maine and is of Scots-Irish ancestry. When King was two years old, his father deserted his family. Ruth raised King and his adopted older brother David by herself, sometimes under great financial strain. The family moved to Ruth's home town of Durham, Maine but also spent brief periods in Fort Wayne, Indiana and Stratford, Connecticut. King attended Durham Elementary School and Lisbon High School. He grew to stand 6'4" tall. King has been writing since an early age. When in school, he wrote stories based on movies he had seen recently and sold them to his friends. This was not popular among his teachers, and he was forced to return his profits when this was discovered. The stories were copied using a mimeo machine that his brother David used to copy a newspaper, "Dave's Rag," which he self-published. "Dave's Rag" was about local events, and King would often contribute. At around the age of thirteen, King discovered a box of his father's old books at his aunt's house, mainly horror and science fiction. He was immediately hooked on these genres. From 1966 to 1971, King studied English at the University of Maine at Orono, Maine. At the university, he wrote a column titled "King's Garbage Truck" in the university magazine. He also met Tabitha Spruce; they married in 1971. King took on odd jobs to pay for his studies, including one at an industrial laundry. He used the experience to write the short story The Mangler. The campus period in his life is readily evident in the second part of Hearts in Atlantis. After finishing his university studies with a Bachelor of Arts in English and obtaining a certificate to teach high school, King taught English at Hampden Academy in Hampden, Maine. During this time, he and his family lived in a trailer. He wrote short stories (most were published in men's magazines) to help make ends meet. As told in the introduction in Carrie, if one of his kids got a cold, Tabitha would joke, "Come on Steve, think of a monster". King also developed a drinking problem which stayed with him for over a decade. During this period, King began a number of novels. One of his first ideas was of a young girl with psychic powers. However, he grew discouraged, and threw it into the trash. Tabitha later rescued it and encouraged him to finish it. After completing the novel, he titled it Carrie, sent it to Doubleday, and more or less forgot about it. Later, he received an offer to buy it with a ,500 advance (not a large advance for a novel, even at that time). Shortly after, the value of Carrie was realized with the paperback rights being sold for 0,000 (with 0,000 of it going to the publisher). Shortly after its release, his mother died of uterine cancer. She had the novel read to her before she died. In On Writing, King admits that at this time he was consistently drunk and that he was an alcoholic for well over a decade. He even admits that he was drunk during his mother's funeral while delivering the eulogy. He states that he had based the alcoholic father in The Shining on himself, though he did not admit it for several years. Shortly after the publication of The Tommyknockers, King's family and friends finally intervened, dumping his trash on the rug in front of him to show him the evidence of his own addictions: beer cans, cigarette butts, grams of cocaine, Xanax, Valium, NyQuil. He sought help, and quit all forms of drugs and alcohol in the late 1980s. * His earliest works (Carrie, The Shining, The Stand, as well as much of the work in Night Shift), deal with working-class families struggling from paycheck to paycheck in minimum-wage jobs. * Late-1990s work sometimes dealt with airplane pilots, writers and others who can frequently afford a second homestead. Stephen King's books have influenced many writers of our time. In the summer of 1999, King was in the middle of writing On Writing: A Memoir of the Craft. At the time, he had finished the memoir section and had abandoned the book for nearly eighteen months, unsure of how to proceed or whether to bother. King reports that it was the first book that he'd abandoned since writing The Stand decades earlier. He had just decided to continue the book. On June 17, he had written up a list of questions that he was frequently asked about writing, as well as some that he wished he would be asked about it; on June 18, he had written four pages of the section on writing. On June 19, about 4:30 PM, he was walking on the right shoulder of Route 5 in North Lovell. Driver Bryan Smith, distracted by an unrestrained Rottweiler moving in the back of his 1985 Dodge Caravan, struck King, who landed in a depression about 14 feet (4 meters) from the pavement of Route 5. Oxford County Sheriff's deputy Matt Baker recorded that witnesses said the driver was not speeding or reckless. Baker also reported that King was struck from behind. King's official website, however, states that this was incorrect, and that King was walking facing traffic. King was conscious enough to give the deputy phone numbers to contact his family, but in considerable pain. The author was first transported to Northern Cumberland Hospital and then flown by helicopter to Central Maine Hospital. His injuries - a collapsed right lung, multiple fractures of the right leg, scalp laceration, and a broken hip - kept him in Central Main Medical Center until July 9, almost three weeks later. Earlier that year King had finished most of From a Buick 8, a novel where one of the characters dies in an automobile accident. Of the eerie similarities, King says that he tries "not to make too much of it." King's 1987 novel, Misery, is also of a writer who experiences severe injuries in an auto accident, but that novel focuses on the mental ill-health of a devoted fan who nurses the writer. After five operations in ten days and physical therapy, King resumed work on On Writing in July, though his hip was still shattered and he could only sit for about forty minutes before the pain became intolerable. King's lawyer and two others purchased Smith's van for ,500, reportedly to avoid it appearing on eBay. Smith, a disabled construction worker, died in his sleep in September 2000 at the age of 43.